As you can see from the countdown to the right it is almost time to leave for our well-earned holiday. This is the first holiday we've had in four years, and the first "grown-up" holiday (ie without the Evilpixie) since our honeymoon to New York sixteen years ago. Of course this new, grown-up holiday can only by accomplished by leaving the house in the hands of the Evilpixie and a couple of her friends who will house and dog sit while we are away. Number one rule - no Facebook parties. Number two rule - no parties of any kind. I am resolved not to worry about what might be happening while I'm not there - if anyone lives near me though - how about doing a quick drive-by every now and then, just to check! We're flying from Manchester, straight into the path of tropical storm Hanna who will be washing up the east coast of the US as we are flying down. Must remember to take the travel sickness tablets - it might be a bumpy ride. I'm all set, with my books chosen - Redemption Falls by Joseph O'Connor, set just after the American Civil War and featuring the descendents of the people who travelled on the ill-fated Star of the Sea; a proof of the new Jim Kelly - Death Wore White - a departure from his usual Philip Dryden series, this one being about two policemen; What Was Lost by Catherine O'Flynn, winner of several awards and a local lass too; and finally the first in David Peace's Red Riding Quartet, 1974, something I'd been meaning to get to for a while. That should keep me going until I hit a branch of Barnes & Noble, or one of the several great second-hand bookstores we'll be visiting. I've got a brand new pair of socks ready to be started with my bamboo dpn's and the first 50g of sock wool in my hand baggage. 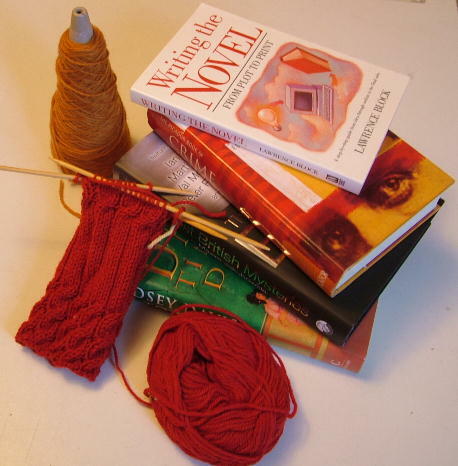 So long as I get them through security OK I shall be knitting all the way across the Atlantic. All that uninterrupted kntting time - wonderful. I'm hoping to hook up with the St Pete Fiber Fanatics while I'm there - someone mentioned a yarn store crawl. You can imagine I am up for that. I'm hoping to be able to blog while we're away. Wi-fi, or netcafe willing I will be reporting on all the yarn and fibre stores, the bookstore and fleamarket finds plus tell you all what we've been up to. Hopefully with photographs. Speak to you all soon, from the other side of the pond. I've got the yarn crawl almost planned!! :) I'm also thinking we might stop at an Alpaca Farm. :) Does that sound good? Will we see you tonight? If you need directions feel free to contact me at gnat(at)barknknit.com.